Want to win a brand new Harman Kardon Nova Wireless Speaker System? Here's how! Well, who doesn't want to take their hands on this and enjoy wireless sound from HK's sound-spanking Nova Wireless Speaker System, for free? A little bit of reading is required, but we can assure you it's time-worthy. 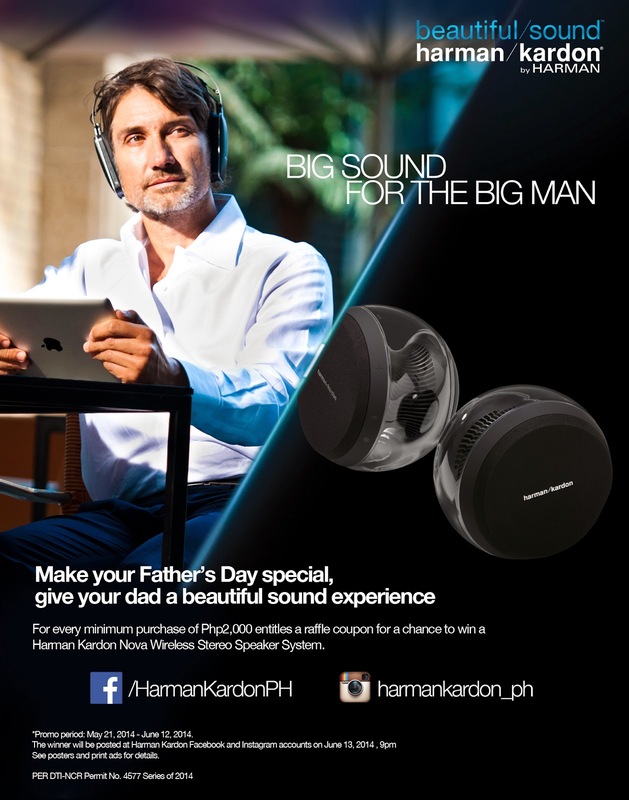 Beyond Innovations brings you the Harman Kardon Big Sound for the Big Man Raffle, where you have a chance to win the Wireless Nova Speakers from Harman. Clients who purchased a minimum of P2,000.00 worth of JBL, AKG and Harman Kardon product(s) will receive a raffle coupon. Client must present their official receipt in exchange for a raffle coupon. The participant must fill out the raffle coupon with their name, address, contact numbers and signature. Big Sound for the Big Man Raffle is open for 18 years old and above. Beyond Innovations Inc. and their Authorized Dealer’s Officers, Employees, Agents, and their relatives within the third civil degree of Consanguinity or Affinity are automatically disqualified. All prizes are not convertible to cash. Raffle stub containing incomplete or false information will be null and void. Participants can drop as many entries but can only win once. Submission of entries will be from May 21, 2014 to June 12, 2014 until store hours (10am-11pm). Raffle stubs will be randomly picked by a Marketing Representative from Beyond Innovations Inc. and with the presence of a DTI Representative on June 13,2014 6pm-8pm at JBL Acoustical Space, SM Megamall. The Raffle winners will be announced at Harman Philippines official Facebook page (https://www.facebook.com/HarmanKardonPH) on June 13, 2014 at 9pm. Winners will be informed via phone call and a control number will be given for validation. Awarding of winners will be on June 14, 2014, 5pm at JBL Sound Gallery, Bonifacio High Street. Prizes must be claimed within sixty (60) days from the date the winner has been announced by Beyond Innovations Inc. otherwise, prizes shall be forfeited as per DTI approval. In claiming the prize, the participant should present two (2) valid identification cards and their claiming stub. In case the winner cannot claim the prize himself, an authorize representative must present a written power of attorney along side with a photocopy of a signature and photo bearing I.D. of the winner. The decision with regards to the selection of winners in the presence of a DTI representative shall be final and unappealable.